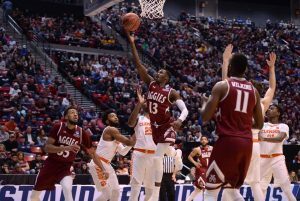 The NMSU men’s basketball team ended its season Friday night, taking a 79-68 loss against fifth-seeded Clemson in the Aggies’ first game of the NCAA tournament. Zach Lofton and Jemerrio Jones were standout players throughout the season, and in Friday night’s game they finished first and second respectively in points scored by NMSU. Lofton earned 29 points on Friday and led the Aggies in points per game throughout the season, while Jones got 13 points on Friday and led in rebounds. This season the team, led by head coach Chris Jans in his first year coaching at New Mexico State, clinched the WAC regular season and WAC tournament championship titles and finished with an overall record of 28-6.